Dara Bunjon is the woman behind the Baltimore Dining Examiner and Dara Does It. She’s got her finger on the pulse of the food industry from PR to food styling to cooking instructions. This post originally appeared on the BDE. Many thanks to Dara for sharing…although I still don’t know what I would say to get the last brownie. What Would You Say Or Do To Get The Last Brownie? I don’t know why but my post have been a bit, not earth shattering thought provoking of late with Sandwiches cut diagonal or across – point and counter point, If you could choose just one cookbook and today’s question, What would you say or do to get the last brownie? I’m not sure what has sparked my introspective meanderings but alas they are here. To answer the question proffered, I go back to the scene in the movie Notting Hill and think a group of friends around the table, and then I think about the friends. Recently I have been dining a lot with media folks so these are who I first pictured in my scenario and think no, they are very cognizant of their weight and would split the brownie equally or just manage one bite each. BAH Note: These are some powerful brownies. I made them to thank our neighbors who had come to our rescue with candles and dry ice during a power outage. Of course, having to test them for quality control, the first batch never made it out of the house. So a second box of Ghiradelli brownie mix was picked up at the store and transformed with a bit of orange zest and five spice powder. It just so happened to be a snowy Saturday when batch number two finally made it next door. And would you believe that when The Mistah and I went outside to shovel, the neighbors had already cleared the sidewalk in front of our house. Now, I can’t guarantee that these brownies will have the same power with your neighbors, but it can’t hurt to try. As Dara said when I related my neighborly story to her, “Simple is good at times.” I couldn’t agree more. Add all the ingredients to a bowl and follow the box directions. suhhhweet! 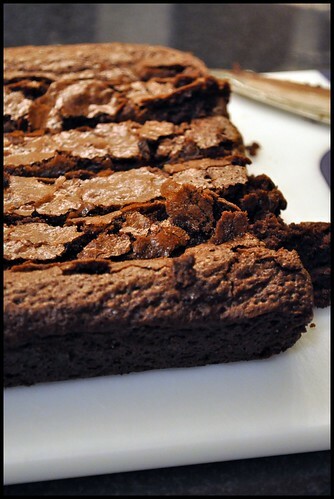 There are other foodistas out there like me who are obsessed with the box brownie?? I made them three times in one month and added extra white and semisweet chocolate chips when I was on my early retirement last month. I am totally going to spice them up next time! Elizabeth, I really liked the 5 spice and orange zest brownies. In fact, I had a hard time giving the second batch away to the neighbors. I’m giggling at your mother bribing you to gain ten pounds! That’s hilarious! My mom was always trying to get my scrawny arse to eat, too, but she never thought of money! Clever, your mom! Oh Kitch, nobody had to bribe me to eat as a kid. I was well acquainted with the stash of oreo’s, nutter butters, and chips in our house. This post was courtesy of one of my guest bloggers. However, I did enjoy making Dara’s recipe and did consider NOT sharing that second batch of brownies with the neighbors. I could go for some of those brownies right now. As for thought provoking posts, non of late just a conduit for public relations firms. I must get my voice back…if you find it, let me know. Thanks for the acknowledgmen. You are right I have my finger on the pulse, mine-looking to see if it is still there. You’re a hoot! Dara, thanks for being part of my food show and tell.